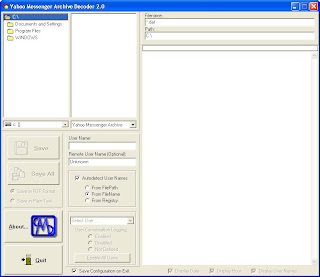 Yahoo Messenger Archive Decoder allows you to view conversation log offline, stored in the archive created by Yahoo Messenger. This free program has only basic features compared with shareware software Yahoo Message Archive Decoder 2.5 from ikitek, but serves the main purpose, and best of all....it's free! - Decodes the conversation archives (*.DAT) offline. - Automatically choose the User Name and Remote User Name from the directory path of the file, from the filename or from the system registry. - See conversation with or without date, time and user name. - Export conversations to Rich Text Format (*.RTF) or Plain Text (*.TXT) files. - New directory browser tree for easy finding files. - Convert all conversation files from current directory at once with Save All option. - Enable or Disable conversation logging offline for one or all users of the current system. - Save current configuration on exit.